As good as any quote to sum up the theme of this delightful little tome, written eleven years after my favorite Maugham novel, and purported to be the author’s favorite of his own novels. The second speaker above is Alroy (Roy) Kear, an English novelist of middling fame that has been asked to write a biography of one of the recently passed lions of literature--Edward Driffield--by that author’s second wife and widow. And the first and third speaker is our narrator, William Ashenden, to whom Kear has come for information about Driffield’s early life; for Ashenden knew Driffield as a younger man, when the lion was married to his first wife and, by most accounts, at the peak of his literary prowess. The first wife, Rosie, is one of those characters in fiction that comes to symbolize much more than just her role in the story. She was Driffield’s muse and, evidently, the muse to many other men--Ashenden included. Here, the two of them talk about Rosie’s other affairs and Ashenden’s jealousy of them. She is a free spirit, Rosie is, one who sows happiness wherever she goes and, because she does so at least in disregard if not outright ignorance of the social norms that control the rest of society, she is viewed by most as something vulgar. Ashenden himself is troubled by her behavior, trained as he and all men are to believe that happiness can only come from the possession of women. But long after Rosie leaves both him and Driffield for new adventures in America, he comes to appreciate the unique role her spirit played in his art and the art of other great men. This extended passage comes very late in the novel, when Maugham is clearly interested in summing things up and driving his points home. In it, Kear, Ashenden, and the second Mrs. Driffield are reminiscing, and they come across some photos of Rosie that Driffield had kept locked away in a trunk. I’ll make some comments along the way. “And here is the bride,” said Mrs. Driffield, trying not to smile. Poor Rosie, seen by a country photographer over forty years ago, was grotesque. She was standing very stiffly against a background of baronial hall, holding a large bouquet; her dress was elaborately draped, pinched at the waist, and she wore a bustle. Her fringe came down to her eyes. On her head was a wreath of orange blossoms, perched high on a mass of hair, and from it was thrown back a long veil. Only I knew how lovely she must have looked. “She looks fearfully common,” said Roy. “She was,” murmured Mrs. Driffield. Of course she looked different to Ashenden. He is looking at her through the eyes of love, memory, and understanding of what she meant for him. But note especially how vulgar Kear and Mrs. Driffield think she was. It’s not just that they don’t see the muse Ashenden knew--they see something loathsome, something almost opposite. But first, we’ll pause for this wonderful insight into the life of a successful author. We looked at more photographs of Edward, photographs that had been taken of him when he began to be known, photographs when he wore only a moustache and others, all the later ones, when he was clean-shaven. You saw his face grown thinner and more lined. The stubborn commonplace of the early portraits melted gradually into a weary refinement. You saw the change in him wrought by experience, thought, and achieved ambition. I looked again at the photograph of the young sailorman and fancied that I saw in it already a trace of that aloofness that seemed to me so marked in the older ones and that I had had years before the vague sensation of in the man himself. The face you saw was a mask and the actions he performed without significance. I had an impression that the real man, to his death unknown and lonely, was a wraith that went a silent way unseen between the writer of his books and the fellow who led his life, and smiled with ironical detachment at the two puppets that the world took for Edward Driffield. I am conscious that in what I have written of him I have not presented a living man, standing on his feet, rounded, with comprehensive motives and logical activities; I have not tried to: I am glad to leave that to the abler pen of Alroy Kear. I really enjoy this aspect of Maugham’s fiction--the way he peppers the narrative with piercing and lyrical observations of art and artists, and how both fare in an unsympathetic world. More on that later. But for now, let’s get back to Rosie, and how she is viewed by Ashenden vs. Kear and Mrs. Driffield. I came across the photographs that Harry Retford, the actor, had taken of Rosie, and then a photograph of the picture that Lionel Hiller had painted of her. It gave me a pang. That was how I best remembered her. Notwithstanding the old-fashioned gown, she was alive there and tremulous with the passion that filled her. She seemed to offer herself to the assault of love. “She gives you the impression of a hefty wench,” said Roy. That was what Mrs. Barton Trafford had been fond of calling her, and with Rosie’s thick lips and broad nose there was indeed a hateful truth in the criticism. But they did not know how silvery golden her hair was, nor how golden silver her skin; they did not know her enchanting smile. Mrs. Driffield smiled and exchanged a meaning glance with Roy. She sounds lovely, doesn’t she? But wait. Those aren’t the kinds of things she will be judged by. Mercy. Ashenden, how can you possible counter that? Roy burst out laughing and Mrs. Driffield put her hand up to her mouth to hide her smile. That’s it. It’s out. She broke the sexual mores of their society. She must be all bad. “I think that’s a very silly word,” I said. He will try. Ashenden will try to explain what Rosie was in a way they can understand. How was that? Do you think they will understand that? Mrs. Driffield looked as though she had taken a dose of castor oil and had just been trying to get the taste of it out of her mouth by sucking a lemon. “Did he know that she was carrying on with all sorts of people?” asked Roy. “I’m sure he didn’t,” she replied quickly. “You think him a bigger fool than I do, Mrs. Driffield,” I said. Roy laughed again and this time Mrs. Driffield without concealment smiled thinly. “It’s comic to hear you so lyrical,” said Roy. So did I. They just don’t get it. I have noticed that when I am most serious people are apt to laugh at me, and indeed when after a lapse of time I have read passages that I wrote from the fullness of my heart I have been tempted to laugh at myself. It must be that there is something naturally absurd in a sincere emotion, though why there should be I cannot imagine, unless it is that man, the ephemeral inhabitant of an insignificant planet, with all his pain and all his striving is but a jest in an eternal mind. Wow. Write that one down on a small card and carry it around in your wallet. The conclusion here is that Ashenden in unable to make Kear and Mrs. Driffield understand. But there is a deeper question: Is he able to make you understand? Because that’s really the point, isn’t it, Dear Reader. The point of this whole story. Where does great art come from? After the journey you’ve taken through the novel--Ashenden’s journey, a journey through his eyes and heart--are you in a position to understand in a way that Kear and Mrs. Driffield can’t? Okay. So dwell on that for a minute. But now, here’s a twist. For as much as Ashenden understands the role that a character like Rosie can play in the soul and inspiration of a writer, Rosie herself is incapable of understanding what makes a writer truly tick. The very end of the novel is Maugham at his very best, deftly using the narrative flow of his characters and their relationships to explore the very esoteric subject of art and its painful genesis. Here, Ashenden happens to run across Rosie years later while visiting New York. In the course of their discussion, she mentions the child she a Driffield had had at the very beginning of their marriage. “I didn’t know you’d ever had a child,” I said with surprise. Someday, I’ll write a thesis on the use of brevity in portraying horror in fiction, and this paragraph will be one of the examples I cite. The brutal efficiency of the words convey so much more than they deserve to. But Ashenden has a different reaction. The Cup of Life is Driffield’s controversial masterpiece. But note what Rosie says about it. It was The Cup of Life that had raised such a storm of protest; and it was the child’s death and the episode that followed it that had especially brought down on Driffield’s head such virulent abuse. I remembered the description very well. It was harrowing. There was nothing sentimental in it; it did not excite the reader’s tears, but his anger rather that such cruel suffering should be inflicted on a little child. You felt that God at the Judgment Day would have to account for such things as this. Obvious. What writer wouldn’t want to write something like that? And most writers know that that kind of writing comes only from real harrowing experience, not from fancies that are simply dressed up to be. But here’s the best part of all. Rosie’s incomprehension about what would possess someone to write about such a tragic circumstance prompts Ashenden to meditate upon the writer’s life. And, as our narrator, we are privy to the the following thoughts that must surely have passed through Maugham’s mind as well. It is full of tribulation. First he must endure poverty and the world’s indifference; then, having achieved a measure of success, he must submit with a good grace to its hazards. He depends upon a fickle public. He is at the mercy of journalists who want to interview him and photographers who want to take his picture, of editors who harry him for copy and tax gatherers who harry him for income tax, of persons of quality who ask him to lunch and secretaries of institutes who ask him to lecture, of women who want to marry him and women who want to divorce him, of youths who want his autographs, actors who want parts and strangers who want a loan, of gushing ladies who want advice on their matrimonial affairs and earnest young men who want advice on their compositions, of agents, publishers, managers, bores, admirers, critics, and his own conscience. But he has one compensation. Whenever he has anything on his mind, whether it be a harassing reflection, grief at the death of a friend, unrequited love, wounded pride, anger at the treachery of someone to whom he has shown kindness, in short any emotion or any perplexing thought, he has only to put it down in black and white, using it as the theme of a story or the decoration of an essay, to forget all about it. He is the only free man. Wonderfully phrased, 100% true, and makes you wonder how much of the novel you have just read is autobiographical. 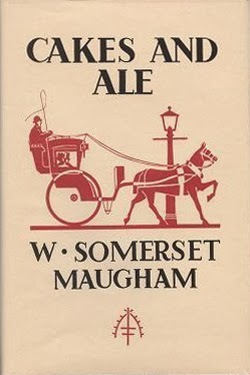 As I think I’ve commented before, Maugham’s observations about the world and the cultures in it in Cakes and Ale are as inerrant as ever. Here’s a few that really jumped out at me. The Americans, who are the most efficient people on the earth, have carried this device to such a height of perfection and have invented so wide a range of pithy and hackneyed phrases that they can carry on an amusing and animated conversation without giving a moment’s reflection to what they are saying and so leave their minds free to consider the more important matters of big business and fornication. Beauty is an ecstasy; it is as simple as hunger. There is really nothing to be said about it. It is like the perfume of a rose: you can smell it and that is all: that is why the criticism of art, except in so far as it is unconcerned with beauty and therefore with art, is tiresome. All the critic can tell you with regard to Titian’s Entombment of Christ, perhaps of all the pictures in the world that which has most pure beauty, is to go look at it. As we grow older we become more conscious of the complexity, incoherence, and unreasonableness of human beings; this indeed is the only excuse that offers for the middle-aged or elderly writer, whose thoughts should more properly be turned to graver matters, occupying himself with the trivial concerns of imaginary people. For if the proper study of mankind is man it is evidently more sensible to occupy yourself with the coherent, substantial, and significant creatures of fiction that with the irrational and shadowy figures of real life. He had drawn breath, walked the earth and presently grown to man’s estate, married, had children and they in turn had had children; I judged from the look of him that he had lived, with incessant toil, in penury. He had the peculiar manner of the country doctor, bluff, hearty, and unctuous. His life was over. I had plans in my head for books and plays, I was full of schemes for the future; I felt that a long stretch of activity and fun still lay before me; and yet, I supposed, to others I must seem the elderly man that he seemed to me.